It’s becoming clear that in Google’s vision of the future, every human tool since the wheel is destined to be folded into the smartphone, that digital Swiss Army Knife around which our lives are increasingly centered. Google’s newest offering replaces an accessory we’ve carried since man first stripped hide from beasts: Our wallet. Google Wallet is a service that eliminates the traditional notion of the leather carrying case, allowing you to store digital versions of your credit cards on your smartphone. Basically, Wallet lets you use your phone to pay for purchases at physical point-of-sale machines. For example, when you’re standing at the grocery store checkout counter, instead of swiping a card or handing over cash, you open the Wallet app, enter a PIN, and wave your phone next to the reader in front of you. The amount you owe is instantly transferred from your bank account. The app rests entirely on a special chip inside the phone called a Near-Field Communication chip. Essentially, any device with an embedded NFC chip can exchange data with a receiving terminal once they come within a few inches of each other. NFC technology is Google’s big hardware bet for the future, and it’s arguably the company’s most ambitious mobile project since Android was first launched. After stopping by the Whole Foods up the street for a quick bite, it only took thumbing in my PIN and gently tapping the back of my phone to the store’s electronic reader to pay for lunch. True to the company’s form, Wallet upsets many vying for the lead in the mobile payments space. PayPal, Intuit, and ISIS (a wireless carrier-backed venture which initially aimed to take on the credit industry) are all companies with toes in the water, toting their own visions of phone-based payment systems. Even Apple is rumored to be working on its own version of NFC-based mobile payments for the iPhone. At the moment, unfortunately, Google’s Wallet is running a little light. At launch, Wallet only supports MasterCards issued by Citibank. To get around that limitation, Google stocks the Wallet with a prepaid card which can be loaded up with cash from your other non-Citibank credit cards. Think of it as a prepaid gift card that you add funds to periodically. Google says it has Visa, American Express and Discover partnerships on the horizon, though there’s no clear ETA on when they’ll be ready for customer use. Once new cards are added, they’ll show up in the app’s main interface, called the “card carousel,” where you can thumb through your cards and decide which one you want to use. Despite not being able to use my Visa, Wallet entranced me. After stopping by the Whole Foods up the street for a quick bite, it only took thumbing in my PIN and gently tapping the back of my phone to the store’s electronic reader to pay for lunch. My phone notified me that my payment was sent, and the cashier gave me the thumbs up to say he received it. No loose change, no sweaty wads of cash to be handled — simple, painless and super fast. I’m usually good at keeping an eye on my battery, but if your phone runs out of juice, consider it the end to your cash flow. Short of finding a nearby extension cord or a back-up $20 in your sock, you won’t be able to pay for much of anything. 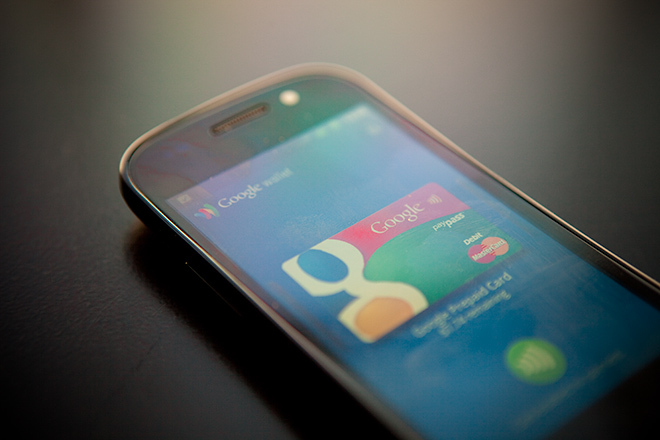 Google says this is a feature of Wallet, not a drawback. One major part of the phone’s overall security involves having to keep the screen powered on while making a purchase. Therefore, if a would-be thief picks up your dead phone, they won’t be able to start jacking up your credit card bills. And after a set amount of time — anywhere from one minute to two hours — you’re required to re-enter your PIN number to use Wallet at all. So even if said thief charged your dead battery, he still couldn’t access your cards. As I see it, security isn’t Wallet’s biggest hurdle — it’s convincing the entire world to catch up. Deploying the infrastructure required to accept NFC-enabled payments is a gargantuan task, even for Google. The technology currently works with MasterCard’s PayPass network — a system that launched in the early aughts but failed to reach critical mass — which is already deployed in over 140,000 locations. Still, that’s a drop in the global retail bucket, and like everyone else, I shop at a lot of that aren’t included in the PayPass domain (sorry, Petco). And there’s another hump: training legions of unwitting employees how to accept the thing. Try explaining that you want to split the cost of your Slurpee — half on the phone, the other in cash — to the confused broseph at the 7-11. It is not, by any means, a frictionless exchange. That’s to say nothing of the dearth of devices actually capable of utilizing the technology. The app will initially launch on exactly one phone: The Sprint-carried Samsung Nexus S 4G. But this is Google’s modus operandi. Oddball, outlandish, far-fetched — these words are compliments to Google, a company long accustomed to leaving naysayers and hand-wringers in its wake. Products like Wallet are its forte, and will continue to push us towards Google’s fantastical idea of what the future should be. TIRED Currently only works with one out of the 15 major banks that issue MasterCards. Try and use it, and cashiers will look at you like you’re crazy. Infrastructure in its infancy, and there’s no guarantee it won’t die on the vine.